We are so glad you stopped by to see what Sir Frederick and Gertie are up to. There are lots of things to see and read here, and we will include more as time goes by. 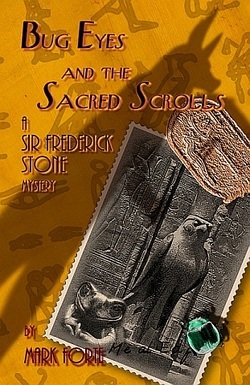 Would you like to learn more about the characters of the book, the history of the super Animals, and how the story made its way from Cairo as a manuscript in 1939 to the book in your hands today? Just let us know! What? You have not read the book, yet? That is easily fixed. You can start by reading the first chapter here. Bug Eyes and the Sacred Scrolls has been released in both paperback and Kindle versions, so when you are ready, you can order your own copy here. While you are waiting for your print edition to arrive, please feel free to poke around the site. You can even send me a message. Signed copies of the paperback edition are now offered in Mark Forte's shop on etsy.com. Signature can be dedicated as requested. Bulk orders on request.